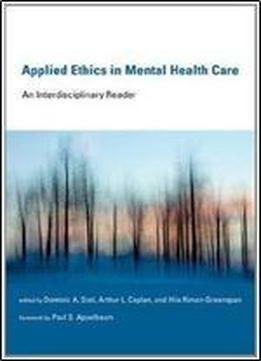 This book discusses some of the most critical ethical issues in mental health care today, including the moral dimensions of addiction, patient autonomy and compulsory treatment, privacy and confidentiality, and the definition of mental illness itself. Although debates over these issues are ongoing, there are few comprehensive resources for addressing such dilemmas in the practice of psychology, psychiatry, social work, and other behavioral and mental health care professions. This book meets that need, providing foundational background for undergraduate, graduate, and professional courses. Topics include central questions such as evolving views of the morality and pathology of deviant behavior patient competence and the decision to refuse treatment recognizing and treating people who have suffered trauma addiction as illness the therapist's responsibility to report dangerousness despite patient confidentiality and boundaries for the therapist's interaction with patients outside of therapy, whether in the form of tennis games, gift-giving, or social media contact. For the most part the selections address contemporary issues in contemporary terms, but the book also offers a few historic or classic essays, including Thomas S. Szasz's controversial 1971 article "The Ethics of Addiction." Contributors include Laura Weiss Roberts, Frederic G. Reamer, Charles P. O'Brien, and Thomas McLellan.